When Lester Coney contacted The Center to assist with this project, he told us that he always kept memorabilia. Coney recalled that while he was in college, he built a collection of pictures and other items with sentimental value. When he moved home, he “kept those items in a trunk in the basement. Then there was a flood, and everything was destroyed.” Distraught, Coney promised himself he would never let that happen again. The Center designed the inside covers of the books to be lined with beautiful sheets of hand-made marbled paper. A detail showing the marbled paper and leather binding of Book I. Decades later, Coney received an invite from his long-time friend, former President Barack Obama, for the White House’s St. Patrick’s Day celebration. Coney hadn’t been to the White House since he went on a school field trip as a kid, so he knew it was a special opportunity. 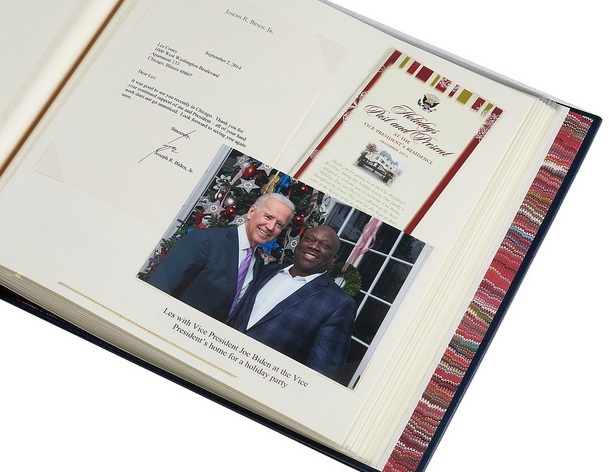 From then on, he started collecting all invites, letters, holiday cards, and anything else from the Obama family. Coney recalls how special it is to have a hard-copy now that most things are sent via email. Inside Book I with examples of the types of hardcopy items Coney saved. Once again, Coney’s collection of memorabilia had grown, except this time, he knew he needed a plan. Looking at his collection, he asked himself, “what can I do to capture that?” Coney had asked The Conservation Center’s CEO Heather Becker about the project, since they have been friends for a long time. Once Heather assured him that we would be more than happy to take on the project, the planning began. A page from Book I. A page from Book II. President Barack Obama, Lester Coney, and First Lady Michelle Obama at the congratulatory reception for the President-elect Barack Obama at The Standard Club in Chicago, November 2008. The entire process lasted over a year, since Coney didn’t want to complete the scrapbook until Obama was out of office. Everything he could find referencing his involvement with the Obama Administration is included: from his 2004 ballot receipt, to photos of Coney’s son Javon playing basketball with Barack Obama in 2008, to the program from Obama’s Farewell Address in 2017. Scrapbook page with photos of the basketball game between Javon Coney and Barack Obama. Coney’s collection was split into two fifty-page leather-bound books, which were custom-made and designed by The Center. We decided to create one red and the one blue book, both of which were enclosed in two clam-shell boxes with leather labels on the spines. Many items needed to be carefully taken out of their frames for digital reproduction and reinstalled. Additionally, the treatment of some items included removing photo corners or harmful adhesives. Book I in its custom-made clamshell box. Book II in its custom-made clamshell box. Our team worked extensively with Coney to design the books, all while using a digital mock-up of both scrapbooks. We collaborated on paper color and type, the font of the captions, the letter press, and more. Of course, Coney also provided the team with the captions for each item included in the books. The scrapbooks have full leather covers, and each have gold stamped titles and a gold panel line on the front. The endsheets are covered with hand-made marble paper, and the photos and ephemera are mounted on cream pages enclosed in protective mylar sleeves. The pages are mounted to archival Stonehenge paper hinged with stubbing. We also added two additional pages per book for mounted three-dimensional items, and made sure to postbound the books so that new pages may be added in the future. Every photo in Coney’s scrapbooks are archival digital reproductions of the originals that The Center created, most of which now reside in a lockbox in a safe location. Many of the digital reproductions were printed on either rag or satin in actual size. Having reproductions in the scrapbooks saves the originals from the wear-and-tear that the reproductions get through regular use and enjoyment. Besides, Coney told The Center, the scrapbooks are usually the first things guests look at when they visit his home. Clamshell box of Book I.
Clamshell box of Book II. Lester Coney calls his scrapbooks “the most precious items I own,” and that “it was an excellent job done by The Conservation Center.” He is so pleased with the result that he is planning to start a new scrapbook with us to document the highlights of his incredible life, for him and his family to enjoy for generations to come.